Cranberry and cinnamon are both favourite holiday flavours. This ruby red syrup is as pretty as it is delicious and it makes a wonderful hostess gift. You can find nice small jars or bottles at many dollar stores. While I usually give it a starring role in festive cocktails and mocktails, you could also reduce it down to thicken it and use it as a glaze on poultry or pork. 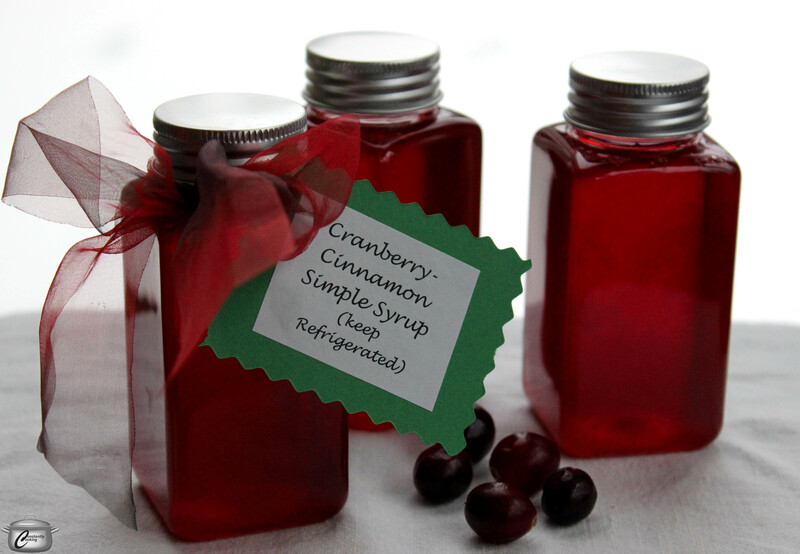 Cranberry and cinnamon are a great flavour combination for this versatile syrup, which makes a great hostess gift. In a medium saucepan, combine cranberries, sugar, water and cinnamon sticks. Stir to blend. Cover pan and bring to a boil over medium-high heat. Watch the pot carefully and reduce heat as needed so it doesn’t boil over. As soon as it is boiling, reduce heat to low and let simmer 15 minutes until cranberries have softened. Remove cinnamon sticks and strain mixture through cheesecloth into a glass measuring cup (for easier pouring). Refrigerate until no longer scalding hot and pour into jars with tight fitting lids. Refrigerate for up to one month; freeze for longer storage (don’t fill the jars as full if you are freezing them). Be sure to include a recipe or two for cocktails/mocktails when gifting – I’ve offered one of my favourites below. Makes 1 cup (250 mL) of syrup. This entry was posted in Drinks, Edible Gifts and tagged Christmas, cinnamon, cocktail, cosmopolitan, cranberry, drink, family, festive, friend, gift, Grand Marnier, handmade, holidays, hostess, lime juice, mocktail, neighbour, party, simple syrup, sugar, triple sec, vodka, water. Bookmark the permalink.